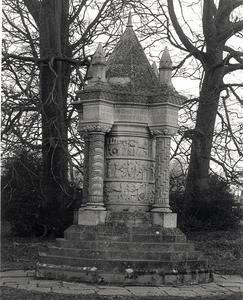 A large cylindrical stone column with a pitched roof, bearing elaborate carvings. 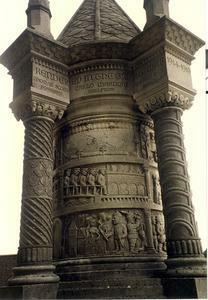 There are four small external columns with geometric patterned carvings set around the main column, rising to tapered pinnacles at the top. The whole is surmounted by a pyramid roof and is mounted on a five-stepped base. 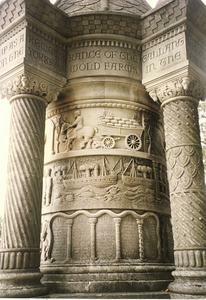 The carved scenes on the main column depict: the Waggoners on their farms; a plan of a field at Fimber; signing enlistment papers with Captain Sykes; being mobilised; leaving Sledmere; joining the ASC; training; crossing to France; supplying the front; German pillage and defending the wagons. LT COL SIR MARK SYKES BART MP DESIGNED THIS MONUMENT AND SET IT UP AS A REMEMBRANCE OF THE GALLANT SERVICES RENDERED IN THE GREAT WAR 1914 BY THE WAGONERS RESERVE A CORP OF 1000 DRIVERS RAISED BY HIM ON THE YORKSHIRE WOLDS FARMS IN THE YEAR 1912 THESE STEANES A NOBLE TALE DO TELL/ OF WHAT MEN DID WHEN WAR BEFELL/ AND IN THAT FOURTEEN HARVEST-TIDE/ THE CALL FOR LADS WENT FAR AND WIDE/ TO HELP TO SAVE THE WORLD FRO' WRONG/ TO SHIELD THE WEAK AND BIND THE STRONG./ WHEN FRA TEASE WOLDS XII HUNDRED MEN/ CAME FORTH FRO' FIELD AND FOLD AND PEN/ TO STAND AGAIN' THE LAW OF MIGHT/ TO LABOR AND TO DEE FOR RIGHT/ AND SO TO SAVE THE WORLD FRO' WRONG/ TO SHIELD THE WEAK AND BIND THE STRONG/ THESE SIMPLE LADS KNEW NOWT OF WAR/ THEY ONLY KNEW THAT GOD'S OWN LAW/ WHICH SATAN'S WILL CONTROLS MUST FALL/ UNLESS MEN THEN DID HEAR THAT CALL/ TO GAN TO SAVE THE WORLD FRO' WRONG/ TO SHIELD THE WEAK AND BIND THE STRONG./ ERE BRITAINS HORDES WERE PAVED OR PLANNED/ THE LADS WHAE JOINED THIS HOMELY BAND/ TO NORMANDY HAS PASSED O'ER SEA/ WHERE SOME WERE MAIMED AND SOME DID DEE/ AND ALL TO SAVE THE WORLD FRO' WRONG/ TO SHIELD THE WEAK AND BIND THE STRONG/ GOOD LADS AND DAMES OUR RIDINGS PRIDE/ THESE STEANES ARE SET BY THIS ROADSIDE/ THIS TALE YOUR CHILDRENS BAINS TO TELL/ ON WHAT YE DID WHEN WAR BEFELL/ TO HELP TO SAVE THE WORLD FRO' WRONG/ TO SHIELD THE WEAK AND BIND THE STRONG. 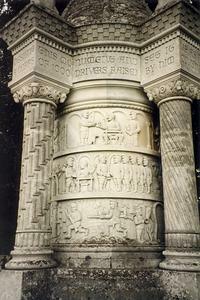 'Sledmere's memorial to World War I', The Visitor's Guide to the North York Moors, York and the Coast, p. 184.